The first HRSC image, which was unveiled to the public in January 2004, showed the Hydraotes Chaos region - a labyrinth of mesas created by the eroding effect of masses of water draining away and ground collapsing to form great voids. 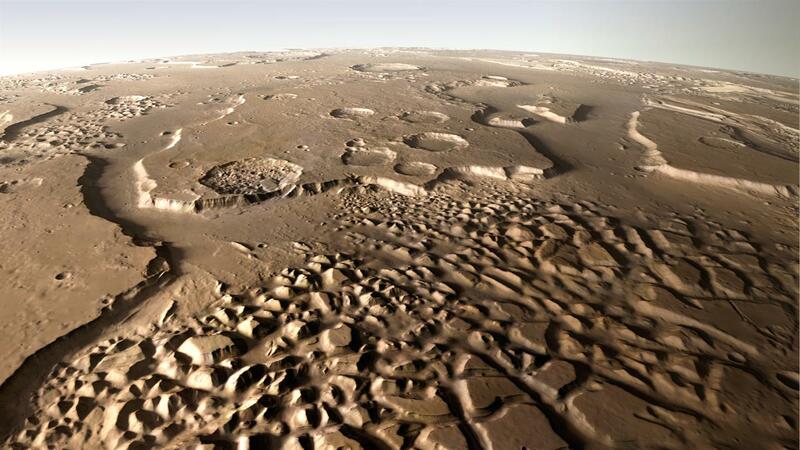 Since then, the Mars Express probe has orbited Mars about 19,000 times at different altitudes. As a result, global coverage has seen constant improvement, with image resolutions of down to 12 metres per pixel. The image here shows a view recently acquired by HRSC from the equator looking north over the striking landscape of Hydraotes Chaos with its more than 2000-metre-high table-mountain outliers in the foreground. The outﬂow channels of Simud Valles (left) and Tiu Valles (right), which are up to 80 kilometres wide and more than 1000 kilometres long, extend as far as the horizon. On 10 January 2004, the first of thousands of detailed images of the Martian surface was captured by the High Resolution Stereo Camera (HRSC), which is a German research instrument on board the European Space Agency’s Mars Express spacecraft, which has been in orbit around Mars since December 2003. During the last 15 years, HRSC has acquired image data during more than 5000 orbits, resulting in a steadily increasing set of spectacular views of the Martian surface, image and digital terrain model mosaics, and movie releases. HRSC coverage of the Martian surface with high resolution (better than 20 meter per pixel) has reached 80 percent. How HRSC works – nine light-sensitive sensor lines are installed in the HRSC, aligned transversely to the flight path. The camera moves across the planet, on board the Mars Express spacecraft. The surface is scanned line by line. To obtain stereo images, it is necessary to map the surface from a variety of viewing angles, which is why HRSC has more than one sensor line. In addition to what is referred to as the ‘nadir channel’, which scans the surface perpendicular to the spacecraft’s flight path, there are four lines directed forward along the flight path and four directed to the rear. Four of these eight lines are fitted with colour filters to produce colour images. This enables imaging of each point on the surface from nine different viewing angles. Computers are used to convert this data into elevation information. On 10 January 2004 the High Resolution Stereo Camera (HRSC) on board ESA's Mars Express spacecraft, acquired its first detailed image of the Martian surface. The spacecraft completed its 19,000th orbit around Mars on 8 January 2019. To date, approximately 360 gigabytes of compressed raw data has been acquired and transmitted to Earth. After 'unpacking' the data packets and performing a first processing step, this has expanded to 5400 gigabytes, which form the basis for further processing into image data suitable for cartography. ESA has extended the mission seven times because of its success; it will last until the end of 2022. Fifteen years ago, early on the evening of Saturday 10 January 2004, over a dozen scientists crammed into a tiny, somewhat austere room at the German Aerospace Center (Deutsches Zentrum für Luft- und Raumfahrt; DLR) research centre in Berlin Adlershof to stare intently at two monitors. They were awaiting the first images from 'their' experiment, the High Resolution Stereo Camera (HRSC). Just over two weeks earlier, the Mars Express spacecraft, launched by the European Space Agency (ESA), had reached its destination and manoeuvred into a stable, elliptical orbit over the poles of the planet. As planned, the experiments were now set to begin. Despite an initial unsatisfactory test, HRSC showed its full potential during the tenth orbit. 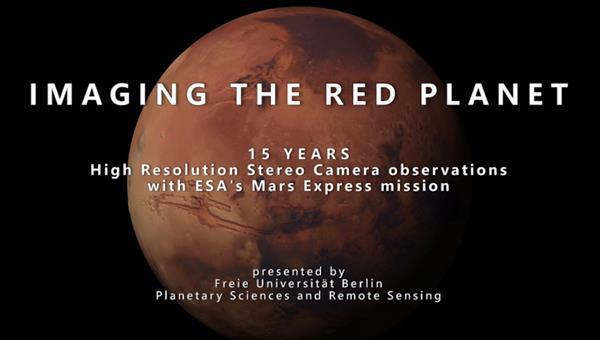 Mars Express transmitted razor-sharp high-definition image data with a perfect brightness distribution via ESA's ground stations to the European Space Operations Centre in Darmstadt. In Berlin the images were greeted with boundless enthusiasm. This was the beginning of a success story that has lasted one-and-a-half decades. HRSC is a German camera experiment developed by DLR and carried on board ESA's Mars Express orbiter; it is operated by the DLR Institute of Planetary Research. The spacecraft has been orbiting Mars since Christmas 2003. This week, on 8 January 2019, the orbiter, dubbed 'MEX' by the scientists and engineers involved in the project, completed its 19,000th orbit of Mars. ESA's first planetary mission is a true 'marathon runner'. In total, the probe has travelled approximately 950 million kilometres around Mars, in addition to its almost 500-million-kilometre journey from Earth to Mars. The total distance travelled is roughly the same as the distance from the Sun to Saturn. The high-resolution image data, in stereo and colour, form the basis for the global mapping of Mars and the creation of digital terrain models that reveal the planet's topography. HRSC has acquired image data during more than 5000 orbits around Mars and thus provided more data than any other German experiment investigating objects within the Solar System. To date, approximately 360 gigabytes of compressed raw data have been acquired and transmitted to Earth. After 'unpacking' the data packets and putting them through the first stage of processing, the researchers have 5400 gigabytes of data, which form the basis for further processing into image data suitable for cartography. The images have resulted in an ever-growing collection of spectacular views of the diverse Martian landscape – from image and terrain model mosaics to animations that can be derived from the digital landscape models. The camera has provided coverage of 80 percent of the Martian surface at high resolution (better than 20 metres per pixel). Originally, Mars Express was intended to last only one Martian year, which equates to two Earth years. Due to its success, ESA has already extended the mission seven times, and it is now set to run until the end of 2022. Ralf Jaumann from the DLR Institute of Planetary Research in Berlin-Adlershof is the Principal Investigator for the experiment; the science and engineering team includes 51 co-investigators. Hundreds of scientists worldwide are now working with the data from the experiment. 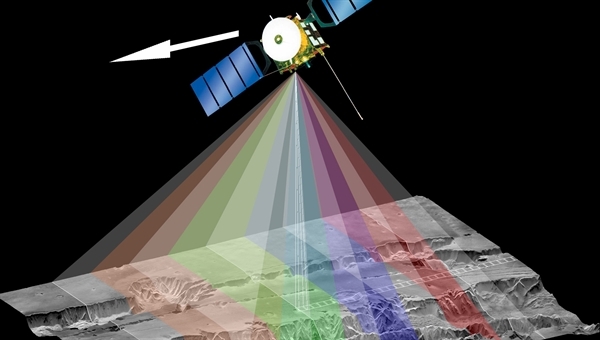 The systematic processing of the camera data is performed at the DLR Institute of Planetary Research. Staff in the Department of Planetary Science and Remote Sensing at the Freie Universität Berlin create the image products that are published monthly. 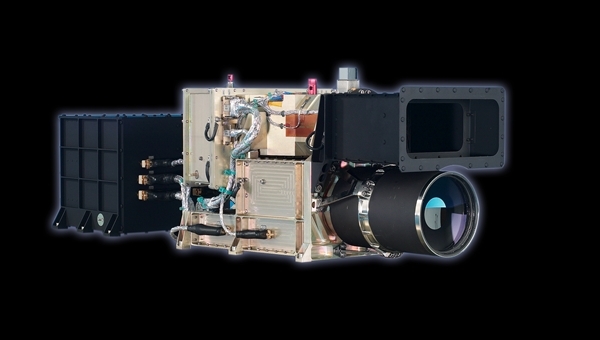 HRSC, which was developed by DLR in conjunction with German industry, represented, at the time, a completely new camera concept that had never previously been used for planetary mapping. Its unique optics – an Apo-Tessar telescope built by Jena-Optronik GmbH – illuminate nine line sensors positioned transverse to the direction of flight that, due to the forward motion of the orbiter, image the same strip of the Martian surface – like a scanner – working line-by-line, one after the other. In doing so, each sensor images the same area on the surface from a different angle. Back on Earth, the four stereo image strips and the nadir channel, which is oriented perpendicular to Mars and provides the highest image resolution at 10 to 12 metres per pixel, are used to create 3D models of the planet's surface. The remaining four of the nine line sensors are equipped with special colour filters for acquiring multispectral data. The focal plane with the nine sensors forms the heart of the camera and was developed by DLR. Lewicki Microelectronic GmbH built the camera's electronics. Dornier (later Astrium and now Airbus Defence and Space) in Friedrichshafen assembled the complete instrument. The camera system was originally developed for use on the Russian Mars 96 mission, but it was lost shortly after launch on 17 November 1996. The flight spare camera, which is of identical construction, was then used on Mars Express instead – after the incorporation of a number of improvements.